Samsung's new displays include this high-contrast LCD TV. Starting tomorrow in California, the Society for Information Display ( SID ) 2007 exhibition in California will be home to many of the latest technologies in the fast-moving world of next-generation displays and televisions. Naturally, one of the foremost exhibitors will be Korea's Samsung , which is showing a full house of gear it hopes will trump all competition. 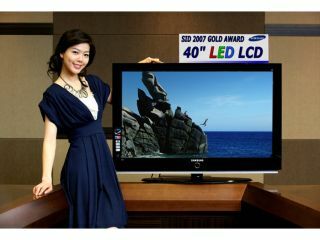 First out for Samsung will be a 40-inch LCD television that uses light-emitting diodes to provide backlighting that gives a contrast ratio five times better than current screens. The LEDs produce a contrast of 10:000:1 - a figure that guarantees more vivid colour reproduction and deeper blacks. In pre-show judging the TV has already been awarded the Display of the Year award, so Samsung is clearly doing something right. Another of the firm's televisual products that will also be putting in an appearance at the SID show is a 70-inch LCD with a 120Hz refresh rate that doubles the rate of most existing models and which also happens to be the largest LCD in mass production. Away from the goggle box, Samsung also has an A4-size colour e-paper panel and a huge 40-inch monochrome e-paper display. The electrophoretic paper, which will be used in advertising, not only uses just 0.2 per cent of the power consumed by a normal LCD screen, but also manages a reasonable stab at a high-definition image with its 1366 x 768 pixels.